As the pharmaceutical industry continues to evolve its focus from small-molecule drugs to balanced product portfolios that include protein therapeutics, analytical chemists are increasingly challenged to produce routine and automated characterization workflows that move innovator and biosimilar biopharmaceutical products forward through development and commercialization. Biotherapeutics are highly complex and heterogeneous products that are fundamentally different from highly purified synthetic small molecule drugs – in size, complexity, in how they’re manufactured, and in the data needed to demonstrate similarity. A large number of these complex biotherapeutics, which are the result of years of pioneering research and complex manufacturing processes, are coming off patent protection, and therefore creating the challenging but billion-dollar opportunity for the introduction of biosimilar versions of innovator products as more biologic drug patents expire. Biotherapeutic proteins are becoming an increasingly important segment of the pharmaceutical industry, requiring scientists whose analytical careers have been invested in traditional small-molecule pharma laboratories to shift focus to large-molecule characterization and analysis. This has created the demand for chromatography and mass spectrometry technology providers to design instrumentation, software informatics, and workflows that are purposefully designed to support protein analysis studies and that are more accessible and automated for acquisition, processing, and reporting from characterization and comparability studies required for innovator and biosimilar approvals. Let’s start with the basics. Since many characteristics of biotherapeutic medicines are unique to, and dependent on, a specific manufacturing process, biosimilar products can only be expected to demonstrate similarity to a reference biotherapeutic product, rather than produce an identical pattern of product variation. The existing regulatory approval pathways for small-molecule generic medicines do not apply to the approval of biosimilars, due to their inherent complexity. Similarity between a biosimilar and its reference biotherapeutic product needs to be evaluated with respect to quality, safety, and efficacy. In fact, regulators realize that with biologic drugs, even batch-to-batch from the same manufacturer, an identical product will not be produced. So we say that the reference product is highly similar from batch to batch, and it is expected that the biosimilar producer will produce something within that range of variation. What does this mean to analytical chemists? While differences will be analytically detectable between batches of innovator and biosimilar biotherapeutics, a biosimilar developer will need to establish that critical product attributes are within the range of the innovator’s product history, or that those changes outside the historical range are not clinically meaningful for safety, purity, or potency. So, it remains the responsibility of the biosimilar producer to evaluate the scope and relevance of any characterization studies to conduct. As regulatory expectations become better defined in developed markets, and demand increases in emerging markets for access to safe and effective biotherapeutics, the opportunities are ripe for biosimilars to achieve accelerating market growth, with forecasts suggesting that the global biosimilars market could reach $35 billion by 2020. Biosimilar development begins with a comprehensive characterization of the innovator product to detail the key structural attributes that will translate into specifications for a biosimilar product. Because originator product has inherent batch-to-batch variation, and attributes can change over time and process improvement cycles, quality attributes must be assessed over multiple batches (two years of batch history has been mentioned anecdotally at industry meetings) to define the innovator product variation for setting the biosimilar specifications. Once the targeted innovator product is understood, a production process for a biosimilar can be designed to attain innovator specifications. Typical data from these studies will detail primary structure attributes (sequence and modifications), degradation profiles, higher order structure studies including aggregation, and host cell protein impurity profiles. The Biopharmaceutical Platform Solution with UNIFI Software, featuring the ACQUITY UPLC H-Class Bio, the Xevo G2-XS QTof mass spectrometer, as well as large-molecule-friendly sample prep, analytical standards, and columns. Waters has been working for more than 10 years to develop biopharma-centric analytical technology and informatics that help analytical scientists address the characterization and comparability challenges put forth by regulators for innovator and biosimilar approvals. Today, our Biopharmaceutical Platform Solution with UNIFI combines the critical workflows needed for biotherapeutic and biosimilar drug analysis. 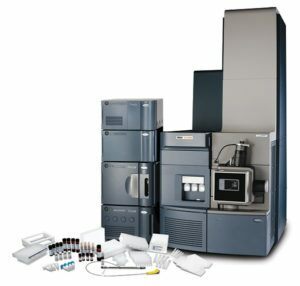 Instrumentation includes the Waters ACQUITY UPLC H-Class or the bio-inert H-Class Bio System for bioseparations, the Xevo G2-XS QTof Mass Spectrometer, a tunable UV detector (TUV) supporting protein and peptide analysis, and a fluorescence (FLR) detector used for quantification in released glycan analysis. UNIFI Software is a workflow-based informatics platform. It enables efficient and automated acquisition, processing, review, and reporting of data from LC/MS and LC-optical detection workflows. Automated processing of data from optical detection workflows includes calibrated size exclusion chromatography (SEC-UV) analysis, and Glucose Unit (GU) normalized analysis (HILIC-FLR) of labeled and released glycan samples. This high-resolution analytics platform is configurable to support biopharma laboratory environments that operate in discovery/early development environments as well as those in later development operating under strict compliance requirements. Fundamentally, UNIFI software can be deployed across a biotherapeutic organization, from drug discovery through quality control. The platform modernizes the way laboratories acquire, share, and communicate data; all data can be stored on a central server and accessed from client PCs. Today, UNIFI Workgroups can be configured to support up to two UPLC/MS systems and an additional four UPLC systems with optical detection only. In the future, full enterprise deployments will expand these capabilities to multiple laboratories and across geographic locations. Waters used the Biopharmaceutical Platform Solution with UNIFI to conduct a model comparability study between a novel candidate biosimilar and its targeted innovator monoclonal antibody infliximab (Remicade). Remicade is a blockbuster drug, marketed by Johnson & Johnson, with U.S. sales of $4.5 billion in 2015. The drug is a TNF blocker and is currently used to treat autoimmune disorders such as Crohn’s Disease and rheumatoid arthritis. Its European patents have expired, opening the way for biosimilar competition, and key U.S. patents are set to expire in 2018. In September 2013, the first two infliximab biosimilars from Celltrion (Remsima) and Hospira (Inflectra) were approved in Europe. Positive Phase 3 data were also reported by U.S.-based EPIRUS Biopharmaceuticals for an infliximab biosimilar candidate, BOW015, which had demonstrated “clinical comparability” to Remicade as measured by the ACR20 response in severe rheumatoid arthritis patients. EPIRUS reported in the summer of 2014 that it has received final marketing and manufacturing approvals within India by the DCGI. This Phase 3 trial also showed no meaningful differences between BOW015 and Remicade with regard to safety or immunogenicity. Celltrion submitted an infliximab biosimilar application for its Remsima product to the U.S. FDA, which was approved in the spring of 2016. This is the first monoclonal antibody (mAb) application to be assessed in the U.S. under the Affordable Care Act. Pfizer announced the U.S. availability of its biosimilar Inflectra (infliximab-dyyb) in the fall of 2016. These 2016 biosimilar launches are being closely watched by the industry. In the following biosimilar comparability study of infliximab performed by Waters scientists, three batches of innovator infliximab (produced in the SP2/0 murine cell line) and three batches of a candidate biosimilar infliximab (CHO cell derived) were compared using the Waters Biopharmaceutical Platform Solution with UNIFI. Samples were analyzed at the level of the intact protein, protein subunits, protein digest, released glycan fraction, and for aggregation and charge variant profiles. In most workflows, each of the six samples was analyzed in triplicate to establish baseline analytical reproducibility. Confirmation of the primary structure (i.e., sequence) is fundamental for establishing biosimilarity with an innovator product. This question can be indirectly addressed at the level of intact antibody mass analysis and antibody subunit mass analysis studies, but requires high-coverage peptide mapping studies to demonstrate the linear order of amino acids within the protein chains. These analyses also serve to define product variation for attributes such as glycosylation, terminal processing, and other protein modifications. A reasonable first step in any IgG assessment is an intact mass measurement that can confirm theoretical molecular mass and profile higher mass modifications (e.g., glycosylation, C-terminal Lys variants). This is a simple and fast experiment with minimal sample preparation, yet it can provide a wealth of information; it can quickly disqualify clones producing a candidate biosimilar that contain sequence errors, or that have fundamentally altered modification variant profiles relative to the innovator. Intact infliximab samples were first analyzed by a quick desalting reversed-phase UPLC/QTof MS analysis to generate comparative intact mass profiles between the innovator and biosimilar samples. The analysis demonstrated consistent mass for a common glycoform found in both the innovator and biosimilar, but showed evidence of differences in terminal-lysine and glycosylation profiles. Such differences do not disqualify a candidate biosimilar, but challenge the biosimilar organization to show that observations are within production history variability, or do not affect safety, stability, or efficacy of the molecule. Using UNIFI Software’s comparative mode for data review and reporting, we were able to visually compare results of this study, and subsequently applied pre-defined UNIFI reporting templates to automate documentation of our findings on relative abundance across all detected lysine and glycovariants. At the intact mass level, it is possible to reduce the complexity of the intact mass result by the use of enzymes to remove N-glycan structures, or to remove the heavy chain C-terminal lysine residues. 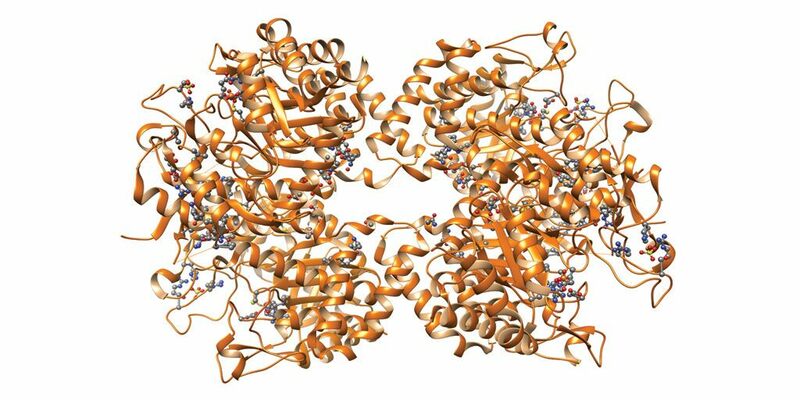 Removing the deglycosylated heavy chain demonstrated that the innovator batches had about 40% residual lysines, while the candidate biosimilar had 60 or 70% levels of lysine. This level was consistent from batch to batch and injection to injection, setting expectations for the reproducibility of this type of profiling assay, in addition to establishing batch-to-batch similarity within and between each sample. Removal of heavy chain C-terminal lysines via digestion with carboxypeptidase B allows glycovariants to be profiled with greater clarity. Unfortunately, the carboxypeptidase coeluted with the Lys-processed mAb by reversed-phase analysis, so denaturing SEC/UV/MS was applied to look at the samples after processing. Waters developed a 10-minute denaturing SEC/UV/MS method (presence of organic and acid) to achieve baseline separation of the carboxypeptidase B-treated infliximab/biosimilar candidate from the enzyme and salts. In UNIFI Software, the mirror plot of the resulting data revealed the major glycoform masses were consistent with the innovator and biosimilar samples, but the levels of glycovariants were different in the biosimilar compared to innovator infliximab. Notably, the level of defucosylated glycoform, G0, was higher in biosimilar infliximab; while MAN5 and G0F-GlcNAc glycoform levels were relatively higher in the innovator sample. See the method and data from our structural comparison of infliximab and a biosimilar via subunit analysis. To simplify the complexity caused by profiling two sets of heavy chain glycoforms at the intact protein level, and to better profile lower-abundance glycoforms, we reduced (DTT treatment) the antibody to LC and HC fragments, and analyzed them by a resolving LC/MS method (ACQUITY UPLC BEH C4 Column, reversed phase) to compare the mass profiles of innovator and biosimilar samples. Deconvoluted mass spectra showed that the candidate biosimilar light chain mass was consistent with the innovator infliximab specifically; the MaxEnt 1 deconvoluted spectral peaks for LC from batches of both samples revealed masses that were consistent within experimental error. No evidence of glycosylation or other significant modifications were observable in the light chain profiles, and lower level peaks in the deconvoluted spectra were consistent between innovator and the candidate biosimilar. Deconvoluted mass spectra of heavy chains from innovator and candidate biosimilar infliximab again showed that the candidate biosimilar heavy chain masses were consistent with innovator, but the levels of glyco and lysine variants were different, as first seen in the intact analysis.